Uranus conjunct Neptune is a rare alignment that occurs every 168 years. The last Uranus Neptune conjunction was in 1993 at 19° Capricorn. People born from 1990 to 1996 will have this major planetary aspect in their chart within a 5° orb of influence. Uranus conjunct Neptune is being activated by transiting Pluto in 2017 and 2018, and by transiting Saturn in 2019. See Pluto conjunct Uranus transit and Pluto conjunct Neptune transit. 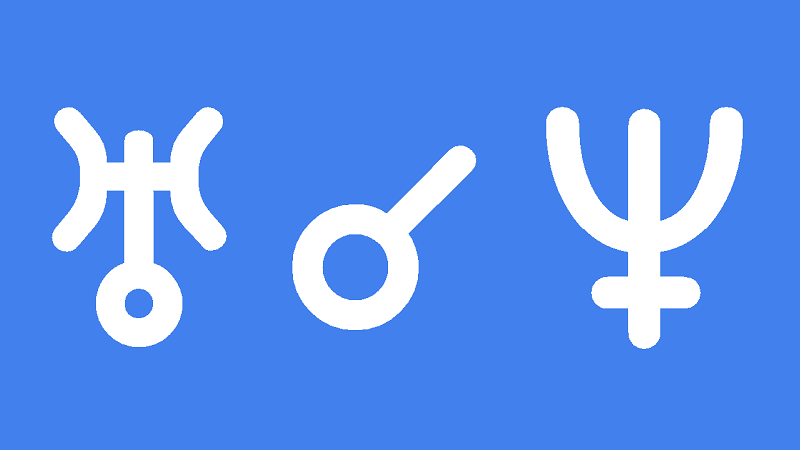 Uranus conjunct Neptune in the natal chart gives unique creative talents and an unorthodox approach to spirituality and morals. You have a natural freedom of expression that is inspiring to other generations. You approach life unbound by the restrictions of tradition, religion and societal standards. Your imagination is allowed to run wild compared to most people. This enables to you freely explore, invent and create in every area of life. Some may find you eccentric, scandalous, provocative or rebellious but so what. These are simply side effects of your ingenuity, or creative genius. You can be a rebel but with a cause. You need a lot of stimulation and excitement in your life and find satisfaction or enjoyment in showing off, or showing society different ways of living and doing things. You are a trend setter and have a great ability to entertain, excite and even mesmerize other people. You should be comfortable expressing your unique style and are generally not shy about sharing your talents. This can extend to your self-confidence and ease in putting yourself and your body on display. You know you are special and different but you also know you are not alone. Your whole generation shares a spiritual bond and you can recognize your peers and their works. This aspect is associated with psychic ability and also the ability to tap into the mass consciousness, at least of your generation. Transiting Uranus conjunct Neptune can be enlightening or scary, or both at the same time. Your belief systems, religion and general perception of yourself and the world around you is rapidly changing. This is a mind expanding influence and you are likely to have many strange experiences and encounters. Such a rapid expansion of your consciousness can be exciting but also unsettling, as your old perceptions of reality are shattered. Your mind is more open to all kinds of influences. This can be a danger if you come under the influence of drugs, deceitful people or even the allure of glamour and fame. You will be more interested in exploring spirituality, ranging for tradition religions to astrology or black magic. You are not so tightly bound by normal moral, ethical and societal standards now. This is great for opening your mind to new possibilities but it can also be destructive if you let yourself be taken advantage of. On the more positive side this can be an extremely liberating and creative time in your life. If you have been bored and struck in a rut then you can find all the stimulation and excitement you need through travel, entertainment, the arts and spirituality. If you are a shy person, you should be able to enjoy more socializing and even some showing off of your creative talents. Your mind and body are loosened up so you can let yourself go through singing, dancing and other forms of fun and creative expression. Creative people, whether musicians or scientists, can find new inspiration and make new discoveries. Sir Richard Burton 0°01′, Liam Payne 0°02′, Charles Baudelaire 0°04′, Niall Horan 0°09′, Gustave Flaubert 0°11′, Zayn Malik 0°27′, Ariana Grande 0°39′, Meghan Trainor 0°56′, Rutherford B. Hayes 1°01′, Sir Thomas More 1°11′, Francis Galton 1°35′, Harry Styles 1°46′, Selena Gomez 1°46′, Cameron Dallas 1°53′, Ulysses S. Grant 2°09′, Louis Pasteur 2°13′, Dakota Fanning 2°14′, Justin Bieber 2°20′. 2. Richard Burton, Brainy Quote. I have this conjunction in my first house and forming a trine to my Jupiter – Vesta conjunction. Will I be the embodiment of this aspect? I have not written about Jupiter trine Uranus but you can read about Jupiter trine Neptune. I’ll look into it. I like how you’re tackling a natal interpretation of the generational planetary aspects. Keep up the good work, Jamie. I was born in september ’89 and astrodienst’s engine claims those planets are conjunct in my chart? Yes that’s right. Astrodienst must be using an orb greater then the 5 degrees I used. You’re exactly right about Uranus conjunct Neptune. My natal Neptune is in 6th house Scorpio & when this transit occurred I had seizures at my (Pharmacy) workplace& was diagnosed with Epilepsy. This has caused constant stress & anxiety as it went through each house – 7th house was strain on relationships. When transiting 8th house I was trialled on many different medicines which never worked & was shy & withdrawn. 9th house I became interested in alternative medicines & therapy hoping to fix this frightening condition. Now in 10th house I’ve been chosen by ‘New Age’ Dr to trial new therapy treatment. He believes epilepsy stems from childhood stresses & extra-sensitive nervous system. I feel he’s the saviour at top of my chart cos my natal Uranus is conj Pluto in Virgo in 4th house. (Overbearing religious Capricornian Mother controlling my life). i have this conjunction in my seventh house, my uranus is in aquarius and my neptune is in capricorn. what does this mean exactly? When were you born? I have the same thing and I was born in 1997. The only difference is I’m Capricorn Ascendent so I have them both in my first house. You obviously do not know enough about astrology to know that URANUS, NEPTUNE and PLUTO are not, have never been and will never be PERSONAL PLANETS. You write as if they are, obviously you have no life experience about what they really are and what they do. What does that even mean? Outer planets affect us personally. Hahahaha, I have this aspect within 07’ and Jamie is quite accurate about it. I feel that it has a strong effect generationally, just as he writes. I’m not sure why you are so harsh and rude about this, but it sounds like you really need some love and maybe a hug. Usually we lash out when all we really want and need is validation and love. I’m quite confused and curious why you think these planets don’t and cannot have a personal effect on an individual? I’ve had deeply personal experiences as well as broader mass-consciousness experiences as a result of Neptune, Uranus, and Pluto transits. Currently transiting Pluto is conjunct this conjunction in my Natal chart and it is very intense for me personally and impersonally. Elder Mountain Dreaming, perhaps You should ask yourself if you can really, truly claim that you know much of anything at all about astrology. You are young and have much to learn. Blessings to the young ! Actually, all outer planets have a huge influence on us personally. The house position of those planets and their aspects to the personal planets and angles see to that. Read Jeffrey Wolfe Green for a deep exploration into the outer planets, particularly Pluto, and what they represent on a personal level. Actually it sounds like your all right but it’s just a matter of semantics. An outer planet alone would have less impact on a personal chart.It would however have more impact say in a synestry chart.ie if someone’s natal Venus had a tight conjunction to someone’s natal Uranus they may feel’electrically ‘charged when in contact with that person ; maybe even ‘star’struck. so to speak.To illustrate : Because Pluto moves so slow many people will be born as the days go by and will share a close placement to Pluto with each other.There would also be 3 passes by Pluto , many more people will be born during this time ! Because of this they will resonate to the vibes of the Personal planet ‘Sun’/ generational planet ‘ Pluto ‘ person. ”Their’ ( The Pluto persons ) Sun would magnify the energy of Pluto , or bring light to Pluto. I would say a generational planet would have more impact by house position .For instance : the 12th house is a house of confinement , institutions.Having Uranus there say wouldn’t necessarily mean the person will become institutionalized at some point , but with their Sun there they may.This may just be an ‘ Old folks’ home late in life. A person with Uranus on the asc. would present themselves to the public as being somewhat ‘ eccentric ‘.A conjunction between a personal and a generational planet in a natal chart would be the most powerful. ‘ fusion ‘ of energy. A local coroner that recently passed had a Sun / Pluto conjunction natal , as an illustration : One of the manifestations of Pluto( 8th house) interests. I think also because of the nature of outer planets (and really all planets as well) are more concerned with the collective and therefore have a higher octave of vibration. The consciousness of the individual is an important component to take into account in regard to the potency of outer planets having a stronger influence for a person. Alice Bailey’s Esoteric Astrology points out that the first order of interpretation is the consciousness of the individual because two people with similar charts can have vastly different expressions of the chart depending upon how their consciousness resonates with the energies being interpreted. Someone who’s consciousness resonates with these higher impersonal frequencies may feel uranus, neptune, saturn, pluto, and jupiter to be stronger in their chart than some of their personal planets. Also, in that case the energies of the constellations will be stronger than the planets as well because the consciousness has become more cosmic so to speak. Could you tell what it mean? is it good ? I can attest too that to some extent.There is a woman .who was drawn to me in a very powerful way She , I , and her husband became good friends. She wanted to have an affair with me , but I said no thanks.2 people in a relationship is tough enough ! I’m a pragmatist. When I found out her birthdate it was the same as Barbara Hand Clows ! Although she had been a high school psychologist , she had no background in astrology or metaphysics She does however have a lot of personal charisma.I also have to take into account that she probably has a different asc.Barb I think is a Chiron rising near the 12th house cusp in the 12th house.My friend probably does not. experience than a human being.However ; though my friend and Barb Clow are obviously on different vibrationary level there still will be a synchronisty there in their experiences on a different level. ♍ Have a good day ! I would also say an outer ‘ generational ‘ planet ( Uranus , Neptune , Pluto ) on the asc.would color the personality of the individuals. ‘ outer ‘ projection of self. I have these at EXACT conjunction at 18 Capricorn. In April 1992 when I was born this conjunction became exact (only a handful of times was it exact at 0 between ’89 and ’96). All you other people who have it within a degree or more aren’t special lmao. You want to talk about unique well first tell you better have it in exact 0 degree orb like me. Oh good for you! 🙂 So I guess we’ll be seeing you on the big screen or in some kind of part of the public eye? Maybe the next Selena Gomez or Miley Cyrus? Or do you consider yourself to be more of an intellectual mind such as Louis Pasteur? Would love to see what the stars have in store for you especially if there are no challenging aspects in your chart. I find it funny that 1990-1996 is the exact time of the golden era of jungle music. It was very much an era of great creativity, unmatched in this time since the conjunction passed, I have a uranus neptune conjunction in 10th house capricorn and am in love with composing jungle music, many other aspects creating and boosting this musical thing that is deeply entrenched in me. Also makes sense to me now that people who used to make this music but werent born in this conjunction have lost the ability to make it after it has passed. It just wasnt possible anymore, they didnt feel it. Everyone is saying now that time was magical and out of this world and in a way they are right, they just dont know what caused it and that people were born in that time to bring the energy back into this world again, and the time is coming (transits) when it will become obvious. Cap. N. Node.Yes ; Nep ‘tune’ can represent music.